Cook Better to Take Care of IBS! Again, I’m slowly getting back on track. Also, while I’m getting a little misty-eyed that summer is coming to an end, I’m also getting a little excited for all the low FODMAP comfort food that I’ll be making as it gets colder! Looking forward to trying my hand at shepherd’s pie, minestrone, spinach pasta bake, and meatloaf. I went out on a limb this weekend and decided to try a gluten free, vegan pancake recipe. Buckwheat Flour/Oat Flour pancakes filled me up, and I had plenty leftover. In fact, I packed some for my lunch today! I’ve been somewhat dissatisfied with pre-made gluten free pancake mixes, and have been searching for homemade, gluten free mixes. I also had a ton of buckwheat flour to get rid of. I put that all into Pinterest, and this recipe came up! It is from The Glowing Fridge. This blog has many, many recipes that are healthy, vegan, and easily low FODMAP modified. 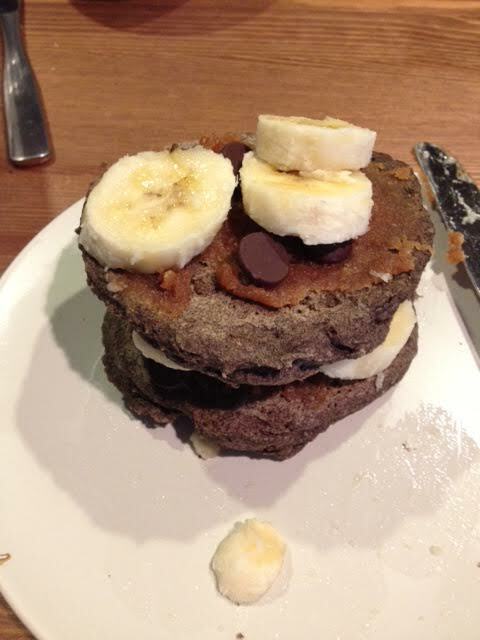 Check out my modified pancake recipe below! 2. 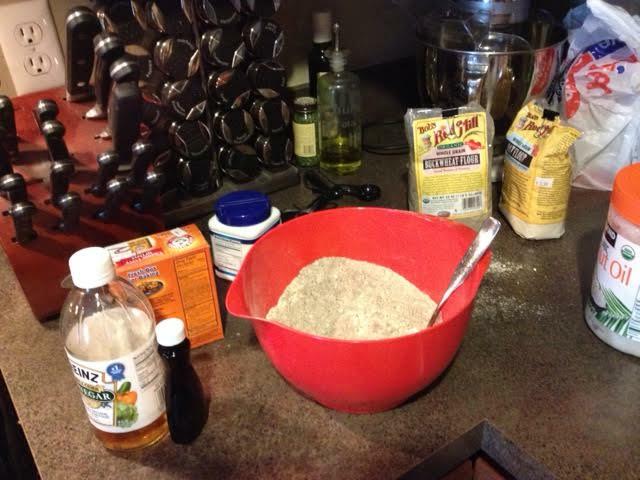 In a large mixing bowl, combine dry ingredients and mix. Add in wet ingredients and mix well. 4. Scoop out pancake batter (about 1/4 cup) and spread out in a circle on the skillet. These pancakes are quite thick, so use the back of a spoon or flat measuring cup to help spread the batter. When edges of pancake appear “stiff” and no longer liquidy, flip over. Cook for a couple more minutes, until pancake appears completely stiff and without liquid. 5. Add more coconut oil and repeat for the rest of the pancakes. 6. Prepare peanut butter syrup by adding all ingredients together, and stir until completely mixed. Add to microwave and cook for 20-40 seconds, or until desired consistency. Alternatively, you could make this on the stove top and heat all the ingredients together. 7. Pour syrup on pancakes, and add toppings, if you so desire. This recipe above is my modified version. The original recipe calls for ground flaxseed instead of chia seeds, which I didn’t have, so I used whole chia seeds. It also called for coconut sugar or sugar of choice, and I had white sugar, so I used that. The original recipe also indicates that my pancakes will turn “golden brown”. 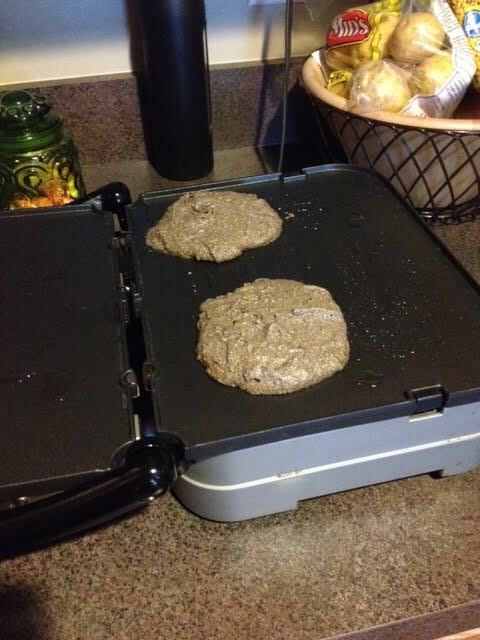 I used buckwheat flour as opposed to grinding my own groats, so my pancakes were the color of cement…no golden brown there. But don’t let the color deter you. They’re amazing, fluffy, and hearty. I would definitely make a few more adjustments, by adding an egg somewhere along the line and maybe grinding my own groats to limit the grainy texture of buckwheat. How’s your low FODMAP life going? What do you do when you have a setback or flare up?